AUSTIN, TX, Oct 27, 2016 – BOXX Technologies, the leading innovator of high-performance workstations and rendering systems, announced the introduction of XDI 8401R-V, the world’s first overclocked virtual desktop infrastructure (VDI) solution. 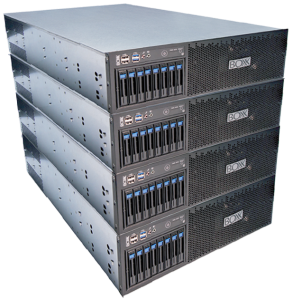 XDI 8401R-V hosts multiple virtual workstations on a single server while preserving the performance and experience for users of graphics intense applications. This one-of-a-kind system also provides organizations with remote access, data centralization, data security, and high speed shared storage. The latest offering from PRO VDI, the BOXX line of both GRID-based and XDI-based optimized configurations, XDI 8401R-V is designed to fully support Autodesk Revit, Maya, Dassault Systemes SOLIDWORKS, and other single-threaded, graphics-intense applications. The rack mounted server relies on the same overclocked Intel Core i7 processor found in BOXX APEXX desktop workstations. Another key advantage of the XDI 8401R-V is the use of NVIDIA vDGA rather than vGPU graphics acceleration technology. Ideal for working with graphics, vDGA allows a virtual desktop to access a professional grade graphics card such as the NVIDIA Quadro for faster frame rates in the application viewport. Economically, it also serves to eliminate licensing costs associated with NVIDIA GRID software. BOXX is the leading innovator of high-performance workstations and rendering systems for visual effects, animation, product design, engineering, architectural visualization, and more. Combining record-setting performance, speed, and reliability with unparalleled industry knowledge, BOXX is the trusted choice for creative professionals worldwide. For more information, visit www.boxx.com. This entry was posted in CAD-CAM-CAE, Featured News on October 27, 2016 by Sharmila Guha.